The brains behind life's more humdrum inventions are heroes of science alongside the likes of Newton and Einstein, says Lisa Jardine. The heroes of modern science preside like deities over our modern world. In spite of the alacrity with which so many people will announce they are dunderheads where understanding science is concerned, almost all of us recognise the names of those who have made milestone scientific discoveries: Copernicus and Galileo, Newton and Leibnitz, Darwin, Faraday and Einstein. The names of those who have contributed inventions and engineered solutions to practical problems in our everyday world, on the other hand, are far less familiar and their names trip less easily off the tongue. We honour the men who framed the universal law of gravitation and proposed the general theory of relativity, but only a handful of inventors' names are instantly recognisable: Edison for the light-bulb, Dyson's vacuum-cleaner, perhaps. Few of us have any idea who invented the devices that make our lives easier: the transistor, the windscreen-wiper blade, the cat's eye, the sewing machine, the jet engine, to pick just a few we all rely on. The 18th Century clock-maker John Harrison, for example, is hardly a household name. Harrison invented a mechanical clock precise enough to provide a solution to the problem of longitude. That problem preoccupied navigators until the arrival of Global Positioning Systems. Whereas a ship's latitude (its north/south position) is relatively easy to calculate as a distance above or below the equator, its east/west position is far more difficult. If a mariner knows the local time, and knows what the time is at the same moment at the zero meridian in Greenwich, then he can work out the angular distance travelled. But making such a calculation depends upon having a timepiece reliable enough to "keep" the time set at the point of embarkation during the many thousands of miles and weeks the ship has travelled. Until Harrison came along, there was no clock that remained sufficiently accurate over long periods of time. Harrison was a joiner's son from Yorkshire, with no formal education. Solving this problem consumed his whole adult life, spurred on by the offer of a handsome cash prize from the British Government to anyone who could do so. He devised a whole range of ways of counteracting the physical factors which prevent the clock's mechanism from running smoothly and behaving consistently. His very first clock, built out of a highly polished, oily hardwood, was virtually friction free, eliminating one obvious source of error. He made complicated modifications to the suspension mechanisms to counteract the erratic movement of ships at sea. He invented the so-called "grasshopper escapement" - a brilliantly efficient mechanism for controlling the periodic movement of a clock's pendulum or balance wheel. Eventually, in his 70s, Harrison produced a marine clock which satisfied the exacting requirements of the Longitude Committee, set up to judge whether any proposed solution fulfilled the conditions set for success in determining position at sea. Much of the trouble John Harrison encountered had to do with the opposition of one of those towering figures of theoretical science I mentioned earlier to all such apparently ad hoc solutions. Sir Isaac Newton was altogether sceptical about any clock-based solution to the longitude problem. Clocks, he maintained, were merely useful instruments. Longitude had to be established using astronomical methods, specifically, the so-called "lunar-distance method", which enabled a navigator to pinpoint his position based on extremely accurate tables of the regular movement of the moon. Characteristically, his submissions to the Longitude Committee as President of the Royal Society were irritable and uncompromising. "I have told you oftener than once that the longitude is not to be found by clock-work alone," he wrote. "Nothing but Astronomy is sufficient for this purpose. But if you are unwilling to meddle with Astronomy, I am unwilling to meddle with any other method." It was only after Newton's death, and years of laborious toiling over the design and manufacture of his clocks, that John Harrison was acknowledged to have provided a practical solution to the longitude problem, and finally earned the cash reward. A week ago I was invited to attend the inauguration of a modern marvel of chronological invention, which was officially dedicated to the memory of the largely forgotten John Harrison. 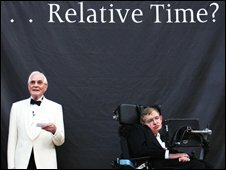 On a bright, sunlit autumnal evening, a sizeable crowd gathered on the corner of King's Parade and Benet Street in Cambridge to watch Stephen Hawking - appropriately, our greatest living theoretical exponent of time - unveil the "Corpus Clock", the brainchild of an Honorary Fellow of Corpus Christi College. 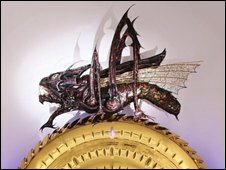 This extraordinary, entirely mechanical chronophage or "time-eater" has neither hands nor numerals to display the time. 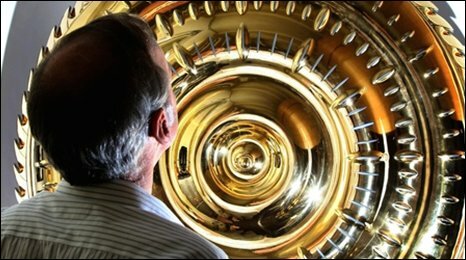 Instead, above a glittering two-metre diameter gold-plated disk, a huge, jaw-snapping, rolling-eyed mechanical grasshopper rocks back and forth, apparently munching successive notches of the revolving dials with every passing second. Its movement triggers blue lights that dart across the clock face, registering the seconds and minutes as they pass. Each hour is signalled by a race of blue lights and the rattle of a chain dropping into an unseen coffin to remind passers-by of their mortality. Occasionally the pendulum hesitates to remind us that our perception of the march of time is subjective. The clock's inventor said at the unveiling he "wanted to make timekeeping interesting", by turning the clock inside out "so you can see the seconds being eaten up" - literally by what is in fact a gigantic grasshopper escapement. Standing modestly to one side during last week's ceremony was the man who invented and executed the clock. Unlike the author of A Brief History of Time, I can almost guarantee listeners have never heard of him. Yet Dr John C Taylor was introduced to the onlookers as "one of this country's greatest inventors" - and so he is. The rather considerable fortune which has enabled John Taylor not only to provide the £1m the extraordinary clock eventually cost, but also the millions to turn the former bank building which houses it into a brand new undergraduate library for his old college (and I might add, educational bursaries including one held by a research student at my own institution), was accumulated as a result of a more humdrum invention, but one which is now so ubiquitous that we all of us depend on it. It was he who perfected the kettle thermostat, the bimetallic strip which ensures our kettle switches off once it has boiled merrily for a few seconds, rather than boiling dry. This simple, elegant little invention is used globally in a wide variety of thermostatically controlled domestic electrical appliances. It is hard to imagine how we would do without it. Why, then, does his name not figure on honours boards across the British Isles? Clocks are only one among a roll-call of instruments and appliances perfected by technical wizards over the centuries. Precision instruments are essential for testing the hypotheses of the very theoretical science which disparages the achievements of the inventors and technicians who designed and made them. No experimental science would be possible without clocks capable of measuring tiny increments of time. Inventors like John Taylor turn the breakthroughs made by theoretical science into the applied benefits we see all around us. 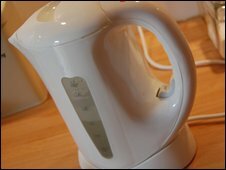 His company's website lists among their achievements not just corded and cordless kettles, but under-floor heating with a cordless connector and a new coating to make kettles boil less noisily. Perhaps if our society were more ready to celebrate those who are ingenious, or "good with their hands", and produce the inventions that allow us to lead comfortable daily lives, we would all become genuinely interested in the science that underpins the kettle and the clock. Perhaps more of our children would then decide to make science their specialist study at school and university. But in order for that to happen theoretical scientists in their laboratories and universities have themselves to be prepared to acknowledge the importance of engineers, inventors and technicians of all kinds, so that their achievements are celebrated as they deserve, and their names trip as easily off our tongues as those of Einstein and Newton. We scientists are always happy to acknowledge the engineers and technicians with whom we work. You can't do anything in a lab without vast quantities of cunning and complicated equipment. It is, in fact, the media who favour the apparent high ideals of science and who both praise and vilify without appreciating the vast contributions from everyone. Without scientists, engineers have nothing to work with. Without engineers and inventors, science stagnates. They're two halves of the same coin of progress. I was fascination by and studied sciences at A-level, then went on to get an engineering degree. I am constantly amazed and saddened by the sheer boredom of most people's responses to these subjects. My sadness is because it has become so fashionable in our society to devalue and disregard the very things upon which so much of what we regard as desirable in life depends. Our ability to manipulate the world around us lifts us above the cave-man standard of living we would otherwise endure, yet it is regarded as uncool in the extreme to admit to enjoying these subjects at school. Possibly even worse when the adult scientist or engineer mentions their shameful profession in polite company - the looks of amused condescension from those who studied the Arts of university have to be experienced to be believed. Witty writing is fine, and I enjoy reading it very much, but I also understand it's the hard-won contributions of scientists and enginers which mean I'm not reading it on parchment, scratched there by a quill pen dipped in juice from a squid. All of the science and technology facilities at my school were funded by the estate of one of the alumni, EP Abraham. Anyone? If you Google "inventor of penicillin" you will get hundreds of results for Sir Alexander Fleming, yet no one actually invented penicillin, Fleming just recognised its medicinal benefits. However, it was EP Abraham who managed to convert the bread mould into a marketable drug that we all use today. "But in order for that to happen theoretical scientists in their laboratories and universities have themselves to be prepared to acknowledge the importance of engineers, inventors and technicians of all kinds,"
Not at all fair, where does this random unprovoked attack come from? I am a theoretical physicist and we do appreciate these guys, we really do, apparently much more than you do. It's not our fault if we talk about our stuff and you listen. You are the media, you go and find your own kettles, it's not my job. I am very grateful to the person or persons unknown who provided an innovation in the household fuse box, the switchable fuse. If a fuse blows in my house, I simply flick a switch and power is restored. When I was a child I remember sitting in the candlelight for what seemed like hours while my father went through the arcane process of removing fuse blocks in turn, examining them and replacing the blown fuse wire manually, all by the light of a dull torch. It was an interminable process and I am very glad I don't have to go through it. Edison held the patent for the light bulb, but the inventor of the world's first light bulb was an Englishman, Joseph Wilson Swan, way back in 1840. Although Newton had reservations about the use of clocks, the person who caused such trouble for Harrison was not Newton, who died when Harrison was 34, but Nevil Maskelyne. Maskelyne was almost 40 years younger than Harrison. He became Astronomer Royal in 1765 and was still in the post when Harrison died in 1776.